Angua wrote: Would lemon and raspberry make a good combination for cake flavours? I will show this confirmation to my fiance for cake. He wants lemon. I like raspberry. Thought it would be a nice compromise. Oh yeah it totally works really well. I don't like eating/drinking in my house anymore. The animals watch me eat/drink and are waiting for me to get close to their mouths so they can just lunge and steal my food or drinks. I'd rather go hide somewhere no one can see me and eat or drink. In general I prefer not to even touch the stuff unless I'm ravenous and sometimes I play little games with it--Can I afford to purge today a bit, or eat/drink less for a while or eat/drink something I hate-hate so I don't feel tempted anymore? I'm not anorexic though just bulimic. And I weigh a lot for a girly-girl of my body type. A lot-A lot. I feel really fat and bloated around most foods or drinks. Why is it that every time I try to find dinner tips that are a) quick b) cheap and c) somewhat healthy, I get all these sites that give me recipes that are none of those things and also contains a bazillion ingredients I've never heard of? I just want someone to tell me what to make for dinner and be able to follow through on it without taking out a mortgage. AngrySquirrel wrote: Why is it that every time I try to find dinner tips that are a) quick b) cheap and c) somewhat healthy, I get all these sites that give me recipes that are none of those things and also contains a bazillion ingredients I've never heard of? Some stuff is a luxury, and not actually required, like fish sauce which is a flavor enhancer, or some herbs to add depth. Unfortunately, recipes rarely tell you that, and rely on your personal experience in order to customize or strip down the recipe. I have a experience with cooking, I can strip a recipe as well as anyone, things being "complicated" or "difficult" is not a problem. But I am a single person with limited funds. If there's more than one type of meat required it is too expensive (I prefer vegetarian food as that tends to be cheaper, but if it's things I can get cheaply I'll allow it). And if I have to buy ingredients with severely limited shelf-life it's an annoyance (I hate throwing away food and I'm only one person so there will be leftovers). I'd like to have a website that takes a list of everything in my kitchen (food, condiments, but maybe even equipment) and then makes recipe recomendations with minimum required shopping. speising wrote: I'd like to have a website that takes a list of everything in my kitchen (food, condiments, but maybe even equipment) and then makes recipe recomendations with minimum required shopping. Come to think of it, I recall there being a page like that back in the day, but it shut down about 5 years ago due to uhm, don't remember. Something about spam. *shrugs* I thought you had a question about a particular recipe. My mistake. NPR used to have a series about pantry leftovers, but the ingredients they had were so stereotypical of public radio, the resulting recipes were disappointing. A neighbor was out of the country and said we were free to pick up their CSA and use it. I attempted to convince the turnips they'd be acceptable in a curry. They were not to be reasoned with. The real disappointment is that the curry was incredibly delicious prior to my foolish addition. There were a couple weeks, a while ago*, the google had a "Recipe" search, and I deeply miss what that could have been. Recipes are a weird intersection of mathematical precision, and arbitrary feelings and preferences. One of the recipe archive sites tries to splice in shopping recommendations, and added a "where to buy" link for the ingredient "boiling water". Why are Martha Stewart recipes huge? Her "easy lemon curd" calls for 8 Large Egg Yolks. I find that to be a high number of eggs. I have chicken pot pie filling, but I'm not sure what crust to use. Should I go only seal the top of a baking dish? Or should I add a crust that is on the bottom and the top? Lastly, Puff pastry shell or storebought pie crust? Or both? The bottom crust tends not to bake properly, I would skip it. As for which crust, how fancy do you want to be? A regular pie crust is very nice, but puff pastry looks more impressive. If using a puff pastry case, bake it and heat the filling separately, then put the filling in when it’s hot. Sealing a crust to the top of the pan is the easiest way to go. PAstrychef wrote: The bottom crust tends not to bake properly, I would skip it. As for which crust, how fancy do you want to be? A regular pie crust is very nice, but puff pastry looks more impressive. If using a puff pastry case, bake it and heat the filling separately, then put the filling in when it’s hot. Sealing a crust to the top of the pan is the easiest way to go. I made both, using premade crusts. I like the flakiness of the puff pastry, but the ease of use of the standard pie crust is pretty nice. It's also more filling. I'm going to try to make a hybrid pot pie with my last batch of chicken filling. I may try one more time with an actual home made crust recipe. Bravetart had a simple recipe that I would like to use. The bottom crust was a little pale, but I think if I preheated my oven to 450 then lower to 400 to bake, and brushed the crust with eggwash, it should brown up nicely in a hot cast iron. If you're outside the US, what's the volume of an egg? If you crack a large egg into a measuring cup, how does it measure? Is there potential in a sort of e-reader, or kind of basic tablet dedicated for storing and comparing recipes? Did palm pilot era tech ever go down that sort of specialized devices? Some years ago, I transcribed and printed out a book of everything in my mom's recipe book. Now my mom mostly saves screenshots from pinterest on her iPad. Anyway, I made cookies using the recipe printed on the Nestle Tollhouse chocolate chips bag. Egg sized are relatively standard, I think. At least, I used "large" eggs in Israel and A-size eggs in the US and had more-or-less the same results. Who, outside the US, cares about volumes of non-liquids? volume? I have no idea, but those are the weights I've come across here. speising wrote: Who, outside the US, cares about volumes of non-liquids? The inside of an egg is liquid. Almost all the eggs in the store, and all the eggs recipes call for are "large", and the contents of a large egg fit pretty neatly in a quarter cup. It's relevant to scaling recipes, and making substitutions or using pasteurized egg from a carton. I got wondering about whether the metric system would favor a different volume of egg. cephalopod9 wrote: I got wondering about whether the metric system would favor a different volume of egg. 50ml/50g is really scale-able (what I learned in culinary class as the volume/weight of one large egg) and easy to include in recipes, and works especially when working at much larger scales, like a bakery who is making 20 pounds of brioche dough, easier to know the amount of egg by weight and just pour it into the scale. Except that few people even have a "quarter cup". A scale is so much easier. Edit: ah, he was asking about metric, yeah. Cool. I only have a 2 cup measuring cup, which starts at 1/2 cup. In the US much measuring in the kitchen is done by volume. If we started to weigh things, we might start using grams, and slide down that slippery slope to going full metric! After that, universal healthcare would be inevitable. I have used a scale since I started baking professionally, but some of my coworkers looked at me funny when I wrote down a recipe with the eggs by weight instead of by the piece. The standard set of cups is 1/4, 1/3, 1/2, 1. I happen to own a set that includes the 2/3 and 3/4 cups as well, but I think they are silly and never use them. For liquids the measurements should start at 1/4 cup. Knowing the weight is useful if you have a container of just yolks or whites and need a specific number. In the US, that’s .5 oz/yolk; 1.5 oz/white. Folks at my current job are amazed that I can translate US measurements into metric or vise versa in my head, pretty much. I'm not a professional, but I do come from a family that bakes. So we definitely have more than the standard measuring tools, like a teeny, shot glass, measuring cup graduated for tea spoons, and an adjustable measuring cup just for stuff like shortening and peanutbutter. 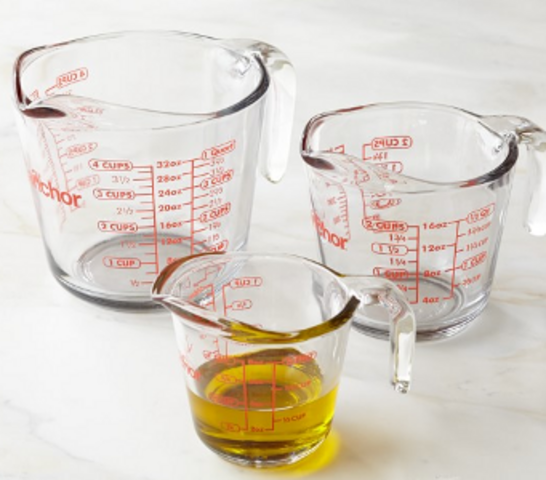 I also understand there's people who don't cook at all, but a liquid measuring cup feels like it should be standard for anyone who does any cooking. Box mixes call for 1/4 and 1/3 cups of liquid all the time. I have a 2 cup and a 4 cup, they both have 1/4 c lines, and they both have lines for metric measurements that go down to 10ml. those probably aren't super accurate. I'm googling "metric measuring cup" and only getting pictures with both cups/oz and ml on them. what we hereabouts use to measure things like water and milk is not a cup, but a clear plastik jug with ml markings, up to 500ml or 1l. Both in Israel and in the US I've had a set of measuring cups and spoons, as well as a scale. I always prefer weighing ingredients, but the vast majority of recipes I've seen measure eggs by whole units (based on large eggs), simply because unless you're working in an industrial kitchen you probably will be using actual eggs and not an egg carton. You don't throw away the partial egg! You save it in a container in the fridge for egg wash of baked goods, or tossed into the next morning's egg breakfast. Sometimes I eat oatmeal. And I don't put any salt in like the directions say, eat it with water, and don't cook it. Ha-ha is that strange or odd? Anyways, I like sugar on it, or brown sugar or cinnamon. And sometimes milk in it... I know animal products again yet I don't actually choose what we buy for the house so what you going to do? Just because it’s in the house doesn’t mean you have to eat it. If you want to, then do so. If you don’t want to, then don’t. Can you help with food shopping to make sure the foods you want are available? My opinions are not accepted by the other members of the household. So I either eat and drink what they choose or I starve. Or feel starving anyways. So anyways, I was just like trying to say how I enjoy oatmeal, and express a guilty pleasure and it got me thinking now that I flat out state no one cares about my dietary restrictions: How much of this is just me clinging onto foods I use to enjoy and how much is their fault? I honestly don't know. I practically make into fetishes foods and drinks made by animals. Best I can do is limit not completely cut out my exposure to them I feel. I think there's a fair number of meals and dishes where reducing, or removing meat components isn't that much of a chane, but there's twisted up cultural value, particularly in America, where going vegetarian, or cutting back on meat is seen as emasculating, and not as good. I like veggie burgers, and i wish fake meat had a better social and cultural niche niche than Vegan (tm), punishment food. There's food stuff that doesn't have any animal products in it, like canned beans, or I think Oreos, that don't want to be associated with vegan branding, and vegan branded stuff doesn't want to be associated with "junk" food. speising wrote: what we hereabouts use to measure things like water and milk is not a cup, but a clear plastik jug with ml markings, up to 500ml or 1l. Is that different than what I'd call a liquid measuring cup? bit of a tangent, I think of a jug as having a handle, and smaller opening, where as a cup, or a pitcher has an open top similar in size to it's base. Also, American convenience stores sell single serving beverage cups larger than of 3/4 of a liter. cephalopod9 wrote: I think there's a fair number of meals and dishes where reducing, or removing meat components isn't that much of a chane, but there's twisted up cultural value, particularly in America, where going vegetarian, or cutting back on meat is seen as emasculating, and not as good. Just wanted to say I appreciate this whole line of reasoning a lot, thanks for posting! I agree that America's values around meat are flipping weird and carry oddly more baggage than is appropriate for "I do or do not eat a foodstuff". Also that the "it's vegan so it's healthy" sort of default attitude people tend to apply to things is totally batshit. The number of counter examples is so large no one should need to make them to begin with. Everything in America is heavily commodified, and is real huge on individual choices and identity. Getting a consumer to see themself as "A Vegan" instead of "partaking in veganism" makes it easier to sell them on related lifestyle brands and products. Also, someone who sees themself as "A Vegan" doesn't have to think through the cost or consequences of their individual choices, like driving up the price quinoa for indigenous populations, or inhumane farm worker conditions. I heard part of a teaser for an NPR story speculating whether "non-gmo!" sentiment might be a plot engineered to disadvantage American agricultural industries. Before I lived through 2016, i would have laughed about that. These days, it's just stupid enough to be plausible. A good chunk of the powers that be have an interest in making people dumber: less aware, and less willing to think. I disagree. People like labels because they're convenient - you're in the same boat with a bunch of other people, you can get the support of others who know what you're going through in a precise manner, it's easy to find communities that take your experiences for granted. People generally like putting these labels on themselves. The problem with labels arises once you use them to police the behavior and group identity of others, but in terms of creating communities, they're fantastic. I also disagree that vegans don't think about the impact of their choices. I'm vegetarian, not vegan, but believe me I've thought about this and I do consider the import of produce from abroad, and I've specifically researched quinoa, since you happened to mention it. Your assumption that vegans don't consider moral implications of their actions is a bit ridiculous. You can argue about how some people communicate their choices, and what the media tries to get people to learn in order to sell their products. I’ve thought long and hard about this, but I’ve finally come to a conclusion: grapefruit are the best citrus. Other citrus are good and all (I mean, of the fruits you can find in any store, citrus is the best), but grapefruit comes out on top of the rest. For the sake of this discussion, I’m not considering acid citrus (lemons and limes). While the pith and membranes between grapefruit segments are bitter, the flesh itself is perfect: juicy, with a great balance of acid and bitterness, plus a little bit of that nice sort of grapefruity twang. Sure, they’re messier than an orange or a mandarin or a tangelo because you have to peel the segments, but the flavor easily makes up for it (and it’s not that hard to do — it only takes a second or two). Other citrus don’t have the right balance of acid and sweetness, and if they do, the flavor isn’t as interesting as a grapefruit is. Lots of other citrus are also smaller and/or harder to peel than a grapefruit is. The grapefruit is the clear winner because of its outstanding flavor, good size, and ease of peeling.